Robert Graham "Tonga" sport shirt in two-tone plaid. Spread collar; French-placket button front. Long sleeves; mitered barrel cuffs. Signature "Knowledge Wisdom Truth" embroidery at shirttail hem. Culturata shirt in extra-soft cozy plaid. Spread collar; button front. Rounded barrel cuffs. Shirttail hem. Cotton. Made in Italy. Model's measurements: Height 6'1"/185cm, waist 32"/81cm, typically wears size M.
Kiton sport shirt in large plaid design. Spread collar; button front. Long sleeves. Barrel cuffs. Shirttail hem. Cotton. Made in Italy. Model's measurements: Height, 6'1"/185cm, Suit 40L, Shirt 15 x 35, Waist 32"/81cm, Inseam 34"/86cm. 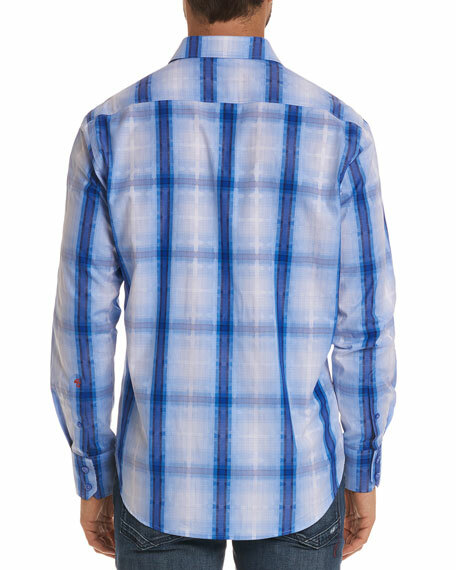 Mediterranean sport shirt in medium tartan plaid. Spread collar; button front. Rounded barrel cuffs. Shirttail hem. Cotton. Made in Albania. Mediterranean sport shirt in medium tartan plaid. Spread collar; button front. Rounded barrel cuffs. Shirttail hem. Cotton. Made in Albania. Model's measurements: Height, 6'1"/185cm, waist 31"/79cm, suit 40, shirt 15.5x35, inseam 32"/81cm. 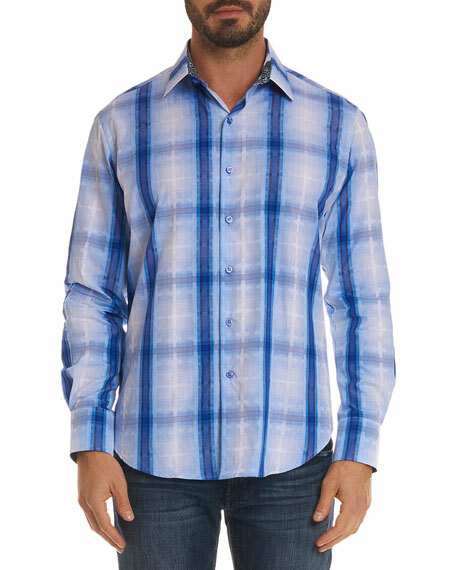 Neiman Marcus sport shirt in micro-plaid. Button-down collar; button front. Rounded barrel cuffs. Shirttail hem. Cotton. Made in Italy. Model's measurements: Height, 6'1"/185cm, waist 32"/81cm, suit 40L, shirt 15x34, inseam 32"/81cm.